Action figures have long been a perfect compliment to comic books, since every kid (or kid at heart) has that natural desire to act out adventures with their favorite heroes off the drawn page. Every so often, a unique style of figure comes along that breaks the mold, so to speak. Each Saturday, Donny B will be showcasing various offerings from Art Asylum’s take on the ‘block figure’, with a weekly spotlight on Minimates. 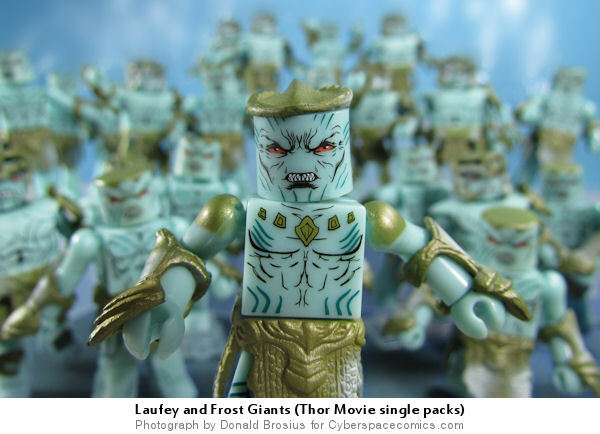 Last week, we looked at the Frost Giant army builders. 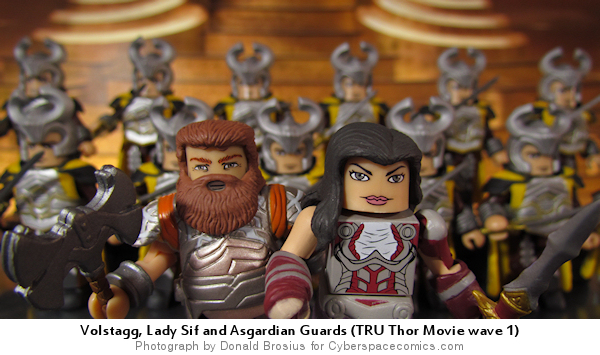 This week, we’re looking at the other army builder in the Thor Moviemates release: The Asgardian Royal Guards. But the guards by themselves are a bit boring, so I threw in two of the bigger guns in the Asgardian army: Volgstagg and Lady Sif. These two characters were released in a TRU exclusive 2-pack, and rumor has it, they will be accompanied by the remaining Warriors Three in a future TRU exclusive release. This was extremely straight forward. I found an image of the Asgardian throne room from the Thor movie, printed it out, stuck it behind the minimates, arranged the lighting, and took the photo. Jessan Hoan reveals to Logan what she’s gone through since the Reavers abducted her. She explains how her life has been severely altered and that she is the upstart crimelord, the Tyger. The operation to advance the Super Soldier Serum continues to unravel as we learn that the President, himself, is involved with this covert experiment. Meanwhile, in Casagata, Marea is engufled by the Man-Thing and submitted to seemingly hallucinegenic mental trip, perhaps created by the Man-Thing’s current Super Soldier Serum infection. Shang-Chi and the Cat pose as drug runners and weapons dealers to get inside Argus’ Terrorist Cell. Black Jack Jarr discovers that Argus has actually advanced the Terrorist Organization in an effort to get the USA to strike back against it and utterly destroy it. I suppose that’s one way to defeat terrorism? Albeit, a strange way of going about it. Ever since the Hulk took the job of the Coliseum’s main bouncer and adopted the name of Mr. Fixit, his casino’s crime rate has decreased to zero while their competitors face rising rates. So, the rest of the casinos hired some thugs to attack Fixit with heavy artillery. Fortunately for the Hulk, he easily survives their barrage … unfortunately for the casinos – the Hulk knows they were behind the attack. The Hulk story was a little too anti-climactic, for me – and Purves’ artwork has never tickled my fancy. Note from the Format Dept: back to the single image wrap format again. Markalan Joplin is best known for writing Robotech: the Macross Saga. 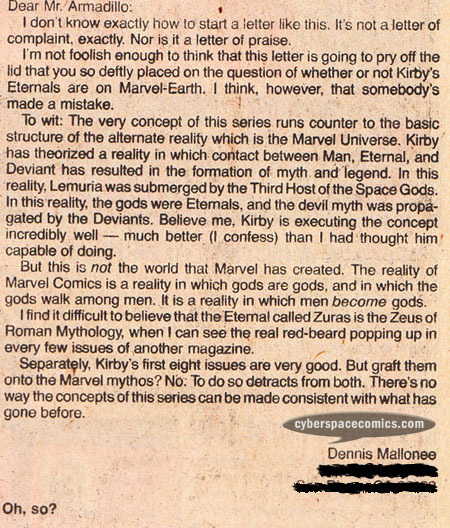 He got a letter printed in Eternals #13 (cover date – July 1977), differentiating “Jack Kirby, the artist” from “Jack Kirby, the writer”. Comics are a visually static medium but, they can also provide a fluid visual through a combination of images. Here’s a look at some covers that fit well together to create a story of their own. One of Spider-Man’s greatest fears is that the radioactive bite that gave him his powers will continue to mutate him. Spectacular Spider-Man explored this concept in a four issue storyline by Paul Jenkins & Humberto Ramos. The Destroyer is a powerful weapon forged by Odin, himself. Throughout the past 45 years of Thor stories, it’s been imbued with the life-force of Thor, Sif, Loki, Balder, Thorgirl (Tarene) and more. 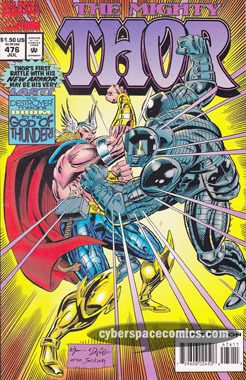 To celebrate Roy Thomas’ big battle between the Destroyer and Thor (in his ‘new armor’), cover artist M.C. 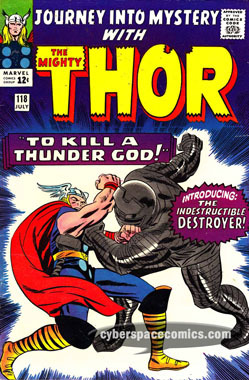 Wyman paid homage to the Destroyer’s first appearance. When the DC and Marvel Universes merged in Marvel vs DC, a new one was created: the Amalgam Universe. 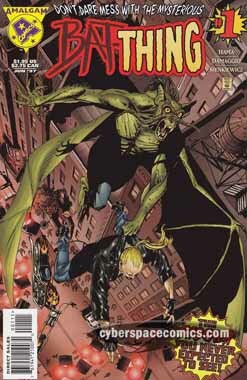 This one-shot combined Man-Bat with Man-Thing. A creature called the Bat-Thing is watching Francie Sallis and her daughter Kelly. This green-skinned, winged monster stalks the night and Detective Clark Bullock has decided to extend the Sallis girls his aid. When some local thugs enter the mix and launch an attack on the girls the frenzy inspires the empathic monster to leap into action. But, who will he attack first? And, what’s his connection to the Sallis girls? Hama handled this book excellently. He’s created a true horror/suspense tale and we’re along for the ride trying to figure out character motivations. If you can read this tale without looking at the cover (I know! It’s an enormously difficult task.) you’ll be in for a real treat. That’s because the artist doesn’t give us a good look at the monster’s face until halfway through the book. All great monster movies use this trick to build up your interest in what the creature is actually going to look like. Damaggio’s art fits the moody tone just right and Sienkiewicz’s inks add that extra touch of artistry that he’s so good at. I’m a sucker for monsters in almost any form of entertainment – and I’m always up for a great Man-Thing story. Put those together, and you’ve got my recommendation for this one. With the Thor movie coming up, Art Asylum has released a large number of Thor Moviemates to cover just about every main character featured in the film. Following the formula that DST has seemingly ‘perfected’ for marketing their movie tie-ins, we have been given one full wave of all the main characters, along with a few TRU exclusives, and one “army dump” of single-packs. The army dumps usually have 3 or 4 different “hench men” and maybe an important character or two. The Iron Man 2 army dump included the different assault drones, plus a “short packed” Justin Hammer. The Thor army dump gave us some Asgardian Royal Guards, 2 different versions of Frost Giants, and the short packed Laufey (King of the Frost Giants) and Selvig. 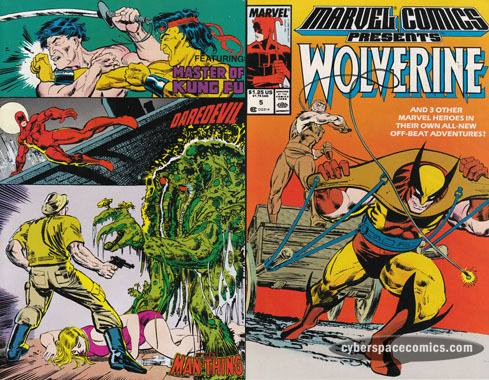 Logan, battered from his fight and huge fall from last issue, is rescued from the Madripoor Harbor by Jessan Hoan. Over the next few days, she nurses him back to health. In Washington D.C., Colonel Jody Choate testifies that his involvement with the Freedom Science Institute was done with the nation’s best interests in mind – attempting to defeat an influx of Communist sentiment. 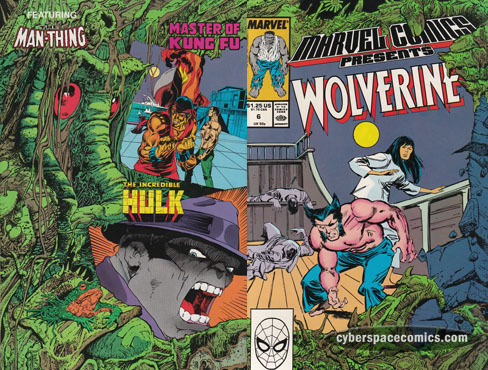 Back in the Florida swamps, “Demon” (we discover her real name is Marea) has thrown off her government bosses now that she’s got the Man-Thing – hoping to use him as a gateway for demonic infestation. And, over in Northern California, the Super Soldier experimentation continues to progress. Shang-Chi and the Cat continue to hunt down the trail that will lead them to Argus and his Terrorist Training Base. And, over at the base, where Argus still has Leiko Wu captive, we discover that he has commissioned a deadly chemical to be produced that will provide immediate incapacitation for its victims. Matt Murdock is contacted by a teenager named Freddy who claims that a man named Rick is out to kill him. But, there’s more to this story than there originally appears. Can Daredevil help this young man before irreparable harm is done to him? The Daredevil story found here is not your standard super-hero tale but does a great job of promoting awareness of mental illness. Note from the Format Dept: this issue’s cover is not in the single image wrap format established by the first issue. In Spider-Hunt, the Daily Bugle offered a $5 million bounty for Spider-Man. Well, with cash that large at stake, you can bet villains came crawling out of the woodwork! Each of the issues from this storyline had a Wanted Poster variant that present a neat visual.